The Executive Board of the Hamden Guardian Services Retirees Association met last Wednesday evening to discuss the recent decision by Personnel to provide annual instead of quarterly Medicare reimbursements to our members. The Board will be investigating further in order to thoroughly address this issue. We will keep our members posted. 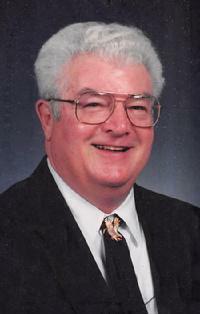 We regret to announce the passing of Robert “Bob” L. Reutenauer, Sr., 78, of The Villages, Fl. on November 8, 2016 after a brief battle with lung cancer. 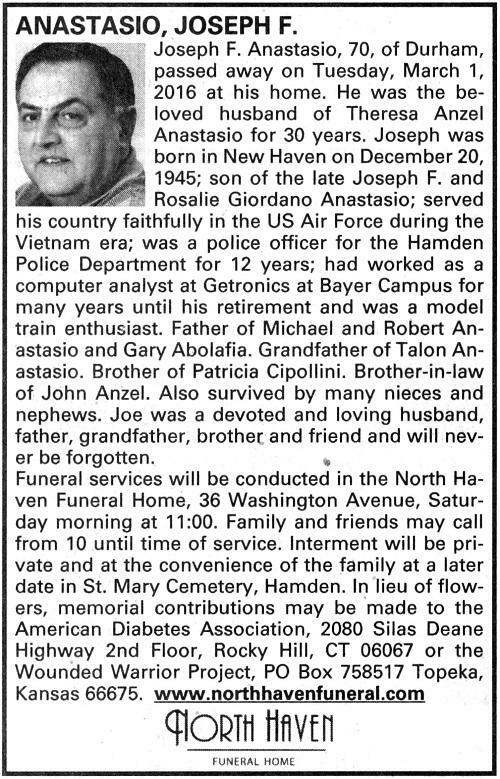 Bob was born January 18, 1938 in Hamden, CT, the son of the late Ethel and Retired Hamden Police Capt. Paul Reutenauer, Sr. 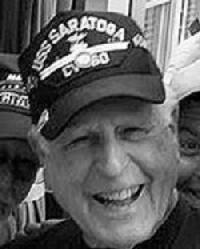 He attended Hamden High School and upon graduation in 1955, enlisted in the U.S. Navy. He spent his career in law enforcement, serving on the Connecticut State Police and the Hamden Police Department from which he retired in 1981. He enjoyed a second career with Lamers Bus Lines where he was a driver for many years until his retirement in June 2016. He is also survived by his brother, retired HPD Officer Richard T. Reutenauer (Jan) of Wallingford, CT; sister-in-law, Connie Reutenauer of The Villages, FL and many nieces, nephews and friends. He was preceded in death by his brother, Hamden Firefighter Paul J. Reutenauer, Jr.
Interment will be Friday, December 2, 2016 at 10am, Florida National Cemetery, 6502 SW 102nd Avenue, Bushnell, FL. A Celebration of Life will follow at the American Legion Veterans Memorial Post 347, 699 Lady Lake Blvd., Lady Lake, FL. Should friends desire, memorial contributions may be made to the American Legion or a charity of their choice. 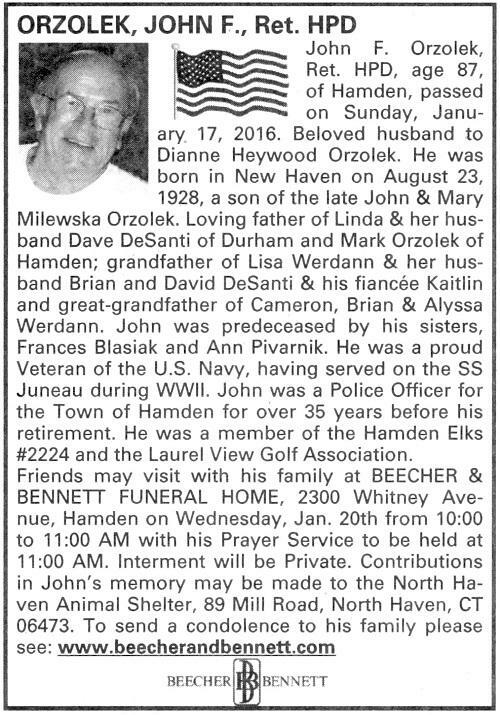 We deeply regret to announce the passing on August 14, 2016 of retired Hamden Deputy Police Chief and Hamden Guardian Services Retirees Association member Donald Hasbrouck. A United States Marine Corps veteran of the Korean War, Deputy Chief Hasbrouck served 28 years with the Hamden Police Department, later serving as Director of Public Safety at Southern Connecticut State University. Friends are invited to attend his Memorial Service on Sept. 3, 2016 at 3:30 PM in the Knapp Auditorium located in the Bridgehouse at Masonicare at Ashlar Village in Wallingford. Interment with Military Honors will be private. Arrangements are in care of Beecher & Bennett Funeral Home, 2300 Whitney Ave, Hamden. In lieu of flowers, memorial contributions can be made to the Masonic Charity Foundation, P.O. Box 70, Wallingford, CT, 06492 or the Yalesville Methodist Church, 8 New Place Street, Wallingford, CT, 06492. The members of the HFRA extend our sincere condolences to the Hasbrouck family and to the members of the Hamden Police Department, active and retired. At the May 31, 2016 meeting, the five-member Executive Board was re-elected to serve until 2020. Complete minutes of the meeting have been emailed to all members. Representatives from Social Security (Medicare), Anthem and Hamden Personnel conducted a Q&A session with retired police and fire personnel at the quarterly meeting of the Hamden Fire Retirees Assn. on January 14th at the Hamden Elks Lodge. Approximately 50 fire and police department retirees attended. Brief videos of the Q&A, with questions regarding Medicare, the Windfall Elimination Provision and Government Pension Offset have been posted on YouTube - more to come - and may be accessed from the Benefits page of this website by clicking on the photo below. More videos will follow shortly, after they have been edited from the original video sources. CLICK HERE: USA Today column by David Walker, "Retiree benefits and ObamaCare Collide"
The Hamden Fire Retirees Association, Inc. (HFRA), is pleased to provide this page on its website to the HGSRA for meeting notices and other announcements of a non-confidential nature. All other info will be sent to members by email or US mail. "Hamden Guardian Services" shall be defined as the Hamden Fire Department and the Hamden Police Department. The Hamden Guardian Services Retirees Association, LLC shall establish and administer a fund for anticipated legal expenses for the protection of its members’ pensions and benefits, to be contributed by, and for the sole benefit of, those participating retired members, widows/widowers of retirees, and eligible ex-spouses of retirees of the Hamden Guardian Services who receive pensions and benefits under the Employee Retirement Plan of the Town of Hamden. Membership in the Hamden Guardian Services Retirees Association, LLC shall be open to any retiree of the Hamden Guardian Services who is receiving a pension and benefits under the Employee Retirement Plan of the Town of Hamden, any widow or widower of a Hamden Guardian Services retiree who is receiving a pension and benefits resulting from the retirement of his or her deceased spouse, or any individual who is receiving a pension and benefits resulting from a divorce settlement with a Hamden Guardian Service retiree. Click here: Segal Co. Pension Recommendations to Hamden Legislative Council. The checks are coming in! Once we receive your membership fee, you will receive an email dues receipt and by-laws. We are at 205 members! HAMDEN POLICE OFFICERS & FIREFIGHTERS! The Hamden Guardian Services Retirees Association, LLC (HGSRA) is an organization formed in September 2012 by Hamden retired firefighters and police officers to oversee and protect our pensions and benefits. It is now a legal entity in the State of Connecticut. (NOTE TO RETIRED FIREFIGHTERS: This is NOT the same organization as your retirees' association, the HFRA, Inc.). Every retired Hamden police officer and firefighter for whom we have an email address or home mailing address has been contacted by either HPD retiree Bob Maturo or HFD retiree Dave Johnson. Information on the new HGSRA was provided along with an application form. If you did not receive the notification and HGSRA application form, please contact this website right away (HFDBadge102@aol.com). Well over two-hundred fire and police retirees have signed up for membership in the HGSRA thus far. If you have yet to mail in your application form you should do so as soon as possible. IMPORTANT: IF YOU HAVE AN EMAIL ADDRESS, PLEASE EMAIL HGSRA SECRETARY DAVE JOHNSON (HFDBadge102@aol.com). RECEIVING YOUR ANNOUNCEMENTS VIA EMAIL WILL SAVE THE ASSOCIATION APPROXIMATELY 50 CENTS OF EXPENSES, AND A LOT OF TIME, FOR EACH NOTIFICATION WE DO NOT HAVE TO SEND BY U.S. MAIL. Please be sure to check this page frequently, particularly during the next few months.